Historic Macedonian documents dating back to the 12th century are in danger of being destroyed due to continual flooding at the country’s newly-built national archives, local media have reported. The new building, which includes the country’s archeological museum and the constitutional court, was only completed in 2014 as part of the former government’s flagship renovation project, Skope 2014. The neo-classical building is estimated to have cost some $51.5 million (€ 42 million). But staff say that poor workmanship and shoddy construction have left them battling constant leaks, risking permanent damage the country’s archives. Journalists have filmed water dripping from the ceilings of rooms which are supposed to protect some 56,000 archived documents. Staff are now in talks with the government in a bid to return to their former base, which they describe as a “tightly controlled environment”. 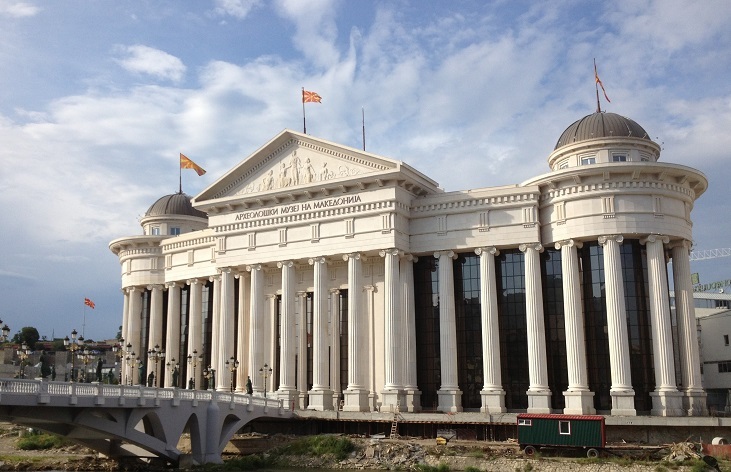 The brainchild of former Macedonian Prime Minister Nikola Gruevski, Skopje 2014 hoped to unite the Macedonian people with a new series of buildings and monuments designed to inspire local pride and cement national identity. Critics however condemned the works as riddled with corruption, while others voiced concerns that the use of disputed historic figures such as Alexander the Great could strain tensions with neighbouring Greece.